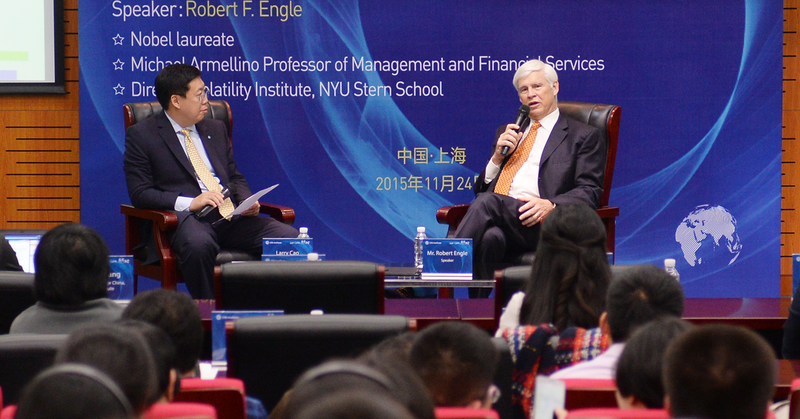 Nobel laureate Robert Engle discussed systemic risk in China and throughout the globe in late 2015 during a live webcast in Shanghai hosted by CFA Institute, CFA Beijing, CFA China, IAIP, and CFA Singapore. Engle explained how his dissatisfaction with VaR’s performance in anticipating the global financial crisis led him to develop SRISK, a longer term risk measure where the “S” stands for systemic, and went on to share his assessment of SRISK levels in key markets today. For additional background on ARCH, VaR, and SRISK, check out our interview with Engle on the subject in 2014 or the Volatility Institute at NYU Stern where Engle is director. Beginning in the early stages of the financial crisis, Engle explained, his team published daily volatility forecasts from GARCH models. And it turns out that the GARCH model was able to predict the financial crisis only the day before. “I think the lesson is that VaR, for all of its wonderfulness, is a way of forecasting risk one day in advance,” he said. “But when we forecast risk, there’s a lot of applications where we also need to know what the risks are likely to be in the long run.” Hence the motivation for SRISK. SRISK is a way of calculating how much capital financial institutions would need to raise to continue to perform their functions normally in the event of another financial crisis. If the bank has sufficient net worth so that the deterioration of its assets doesn’t lead it into insolvency, then it can withstand the financial crisis. And that’s what SRISK seeks to measure. It uses accounting data on liabilities and market data on equities and, of course, the volatility of equity. The good news is that total SRISK globally has come down from about US$ 4 trillion in 2008 to $3 trillion today, largely because SRISK has been falling quite rapidly in the United States. Now it’s actually down to about the same level it was before the 2008 financial crisis. The US banks are improving their SRISK every year, although insurance companies are actually taking on more risk. Engle suspects the insurance industry may potentially compose the systemic risk of the future because it will be forced to take on more risk on the asset side if the low interest rate environment continues. In Europe, SRISK is improving as banks are being recapitalized. Engle estimated that SRISK in Germany is down to US$150 billion, and in Italy to under US$100 billion. “But the two countries that are having a hard time, getting their banks to stabilize are France and the UK, [with SRISK for each country at] about US$300 billion,” Engle said. The first question one faces when studying SRISK in China is whether this type of model works there. Engle thinks it does. In the Western economies, banks that are deemed too big to fail have to be bailed out by the government in a crisis since they would be unable to raise capital in the stock market. “China is very much like the Western countries [in this regard] as there is no possibility that a Chinese state-owned bank is going to fail,” Engle said. When Engle started tracking SRISK a few years ago, China ranked fifth on the list. It moved up into the first spot two or three years ago. The stock market euphoria since then brought temporary relief, but SRISK has again increased since the market’s collapse. “Right now, it’s just about back on the trend line for what it was before the stock market took off,” Engle said. So why is SRISK so high in China? Engle pointed to the banks’ lending to state-owned enterprises and municipal governments. As many of these loans are in fact non-performing, they drag down bank stocks’ valuation. Engle also answered questions from both the live audience in Shanghai and members in satellite locations. For full details, check out the entire webcast. Readers can also access his work on China at the Volatility Institute at NYU Shanghai.